For me, the most difficult thing about teaching so far has been dealing with the mentality of most of my classes regarding the “foreign teacher class.” Because my course does not have tests, homework, or grades, the students become significantly more raucous than they are with their Chinese teachers. The students see an opportunity to take advantage of the foreigner and have fun, a phenomenon I also encountered on my travels to a rural fishing village. When I went to his home village as tourist, the villainous villager pictured above followed me with his BB gun, giggling and firing yellow pellets at me from behind the safety of his leaf mask. I imagine the thoughts going through his head are very similar to the ones going through my students’ heads: “she can’t do anything about it, and this is fun.” And just like the masked boy, my students also have anonymity, only theirs stems from their numbers. I combat the noise level using a variety of teacher tricks and chants, though by far the most valuable weapon in my arsenal has been “The Reaping” box. It is something that I suffered as a student: a container that holds student numbers in order to call upon at random to answer questions or fulfill tasks. When I bring out “The Reaping” box, the students immediately quiet down, looks of terror on their faces. While there are obviously frustrations the territory of being a foreign teacher in China, there a numerous rewards you receive every day, usually in the form of the ridiculous things students say and do. Sometimes I feel like the students do not respect me during a particularly rowdy class, but those feelings are soon mitigated by the interest they show in foreign culture. The students are excited to learn about what we foreign teachers have to offer them, but they lead such rigorous academic lives, that learning happens best in a non-traditional setting. Pictured above is a middle school Halloween party. The students prepared for it in their classes all week and on Friday afternoon, they dressed up in costumes, made jack-o-lanterns, and celebrated with the help of the foreign teachers. One of the more exciting parts of having foreign teachers for the students is that the cultural exchange and learning goes both ways. 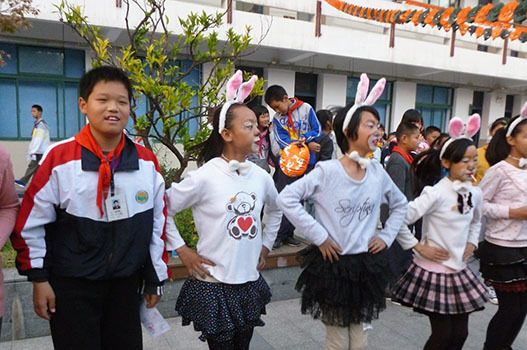 At that same Halloween party, the girls dressed as rabbits taught some of the foreign teachers the dance that they had been performing. It is the experiences like that Halloween party that have allowed me to appreciate that I am like the blue building in the picture. I am incredibly conspicuous and don’t appear to belong. However, it is a part of the landscape as my place in my school and neighborhood is.